There's a wider range of 5-megapixel cameras available at the moment than any other resolution, and the reasons for this are clear. Five-megapixels is a large enough resolution to print well at A4 size but it can still squeeze onto the small 1/2.5-inch sensors that live at the heart of today's tiny cameras. In addition, 5-megapixel chips have been around long enough to have had most of their problems worked out, and prices have fallen steadily. 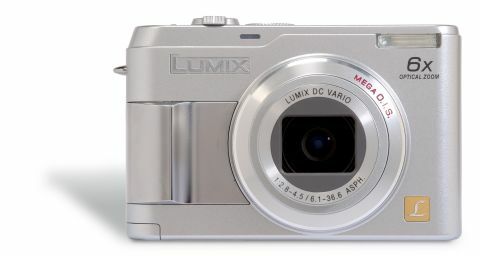 From the outside, the DMC-LZ2 doesn't look very different from any other traditionally styled compact. The champagne ABS shell has just a small amount of smooth metal detailing around the lens and, ironically, where you need it least, on the right-hand side grip. The LZ2's 6x optical zoom's twice the focal length range of most compacts, and the extra reach is immediately noticeable when you start shooting. Zooming's swift and silent, but it takes a moment to 'wake up', even after the camera's switched on. Panasonic relies on its OIS (optical image stabiliser) system to iron out any camera shake at the telephoto end, and the system's so competent and pain-free that it's worth keeping it on all the time. In Mode 1, the OIS works continually, making framing easy, but Mode 2 (activated only when the shutter's released) is better at stabilising in darker conditions. Talking of which, there's no optical viewfinder and the contrasty 2-inch display struggles in dim conditions, so pick your low light scenes carefully. The built-in flash belies its minuscule dimensions by belting out a good whack of illumination. Both coverage and power are fine, and flash exposure is well judged. Slow synch is impressive, as long as you keep the OIS turned on. You can't expect SLR-like functionality at this price and, sure enough, there are no exposure modes other than Auto, and no metering options. While you can force a slow shutter (from 1/8 to 1 second), you'll need to use a tripod as no image stabiliser can eliminate blur at those speeds. Focusing is more flexible, with a slightly confusing choice of four modes. Centre and Spot are straightforward but the Three-area and Five-area modes are less obvious. Basically, they decide for themselves what to lock onto in their respective zones. They tend to opt for the closest subjects, presumably to avoid blurred portraits with sharp backgrounds. The Macro mode is good, focusing down to 5cm at wideangle and offering a creditable 50cm tele-macro. Sensitivity runs from ISO 80 to 400 (200 in Auto mode) and there's the usual choice of white balance presets, colour effects and sharpness tweaks. You can preset two different Scene modes (from Portrait, Sports, Scenery, Night scenery, Night portrait, Fireworks, Party and Snow) onto the main Mode dial for easy access. The Economy mode dims the LCD backlight and turns the screen off faster than any power-save setting, to eke out every last electron from your batteries. The LZ2 is one of the first cameras to be optimised for Panasonic's new oxyride batteries. These disposable cells have been designed for use with high-drain gadgets like digital cameras, delivering a slightly over-spec voltage of 1.7V for faster fl ash charging. In some tests, they've lasted twice as long as the best alkaline batteries, while they cost around the same. For environmental considerations at least, you should buy a brace of good quality rechargeable AAs to fit the LZ2, but it's certainly worth having some oxyrides in your camera bag as back up. Panasonic's Venus Engine Plus LSI processor keeps shutter delay and processing times down, but noise remains a real problem from the 1/2.5-inch sensor. ISO 80 and 100 images are fine, ISO 200 is grainy and shaded areas of ISO 400 images are a mess of blurred edges and colour noise. Burst mode is much better proposition, with a High-speed mode of three frames (max size and quality) in one second, or an Infinity mode shooting at 1.5fps with no limit. As a nice touch, you can leave it in Infinity mode permanently, with the flash setting simply overriding it as necessary. Movies are smooth (30fps) but slightly old-fashioned at just 320 x 240-pixels in size.